While at my parents' home over the holidays, I spent a bit--OK, a lot--of time digging through my old bedroom closet in the hopes of finding a few game-related treasures. Some of the games and systems I found during that expedition surprised me, while others simply brought a smile to my face thanks to the fond memories I have of them. Anyway, I shipped most of these finds back to Seattle before I left my hometown (McFarland, Wisconsin) a few weeks ago. Said shipment just arrived, and I'm so excited about it I could spit. As such, I think I'll document each of them in a short series of posts that will be published over the next few weeks. Expect to see the first one appear tomorrow morning. 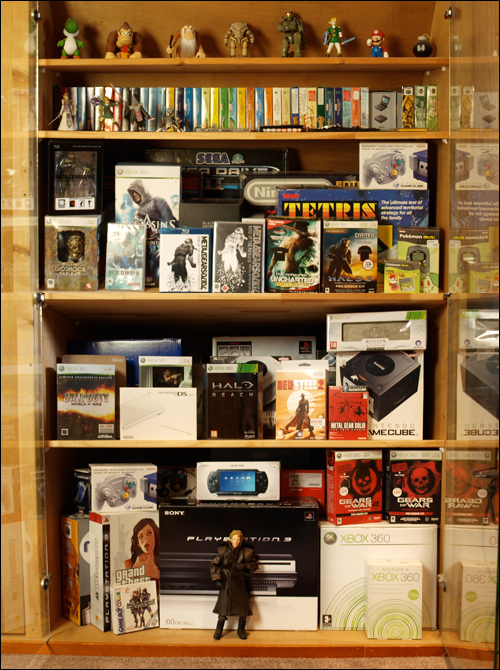 In the meantime, have any of you found any long-forgotten games and/or systems while digging through your childhood bedroom or basement? Note: The photo to the right isn't of the contents of my boyhood closet, although I wish it were. Hey there, Lewis! I guess you didn't notice that note at the end of the post. Sadly, the photo included in this post isn't of the contents of my childhood closet. I found it on the web while searching for "closet" and "games." Sorry for any confusion there. I also should warn that the treasures I found in my closet weren't exactly rare or mind-blowing, although I am quite happy with and excited by them. I love finding hidden treasures. I was going through my collection SNES video games and I get a big smile on face just because I remember the awesome memories I had while playing the games. Like Super Bomberman, I would play with my mom and dad. We would have fun blowing each other up. Mom was the easiest target to get killed fast lol. Super Mario Kart was another I had great memories playing with my dad. He would call me a cheater when I just throw a Red Shell at him before he crosses the finish line, so I would win instead of him. I love your stories, and I agree that one of the best things about finding hidden gaming treasures is reliving, in a way, the fond memories that are associated with them. How lucky are you to have parents who will play games with you, by the way? My mom plays her DS and Wii every once in a while, but even then I can't imagine racing her in Mario Kart. I'll bet she'd like Bomberman, though, should I ever introduce her to it. I do have fond memories of playing with my brother, though. We especially had a great time playing the first Mario Kart together. I swear he beat me in the battle mode about 75 percent of the time, but I still enjoyed it. Anyway, I'll try to share some of those memories in the upcoming posts of this series. Hopefully you'll like them -- and hopefully they'll spur you to share some more of your game-related memories! Ha! My closet, right? Neither, of course. Uh, how about drywall/sheetrock? I love the figures you have at the top of the shelf! Mario, Yoshi, LINK! Even a bom-omb! Oh wow. And I spy some Gameboy games? Really cool bookcase (game case) . Hoo, boy, I really thought my note at the bottom of the post would be read by more people. I guess I was wrong! Believe me, if that was my closet, you would have seen photos of its contents long ago, Daniel! Sorry to confuse you in that regard. I'll start revealing and chatting about the contents of *my* old bedroom closet tomorrow. Also, expect to see a "from the back of my boyhood closet" post every week for the next, oh, five weeks or so. No I totally did not see that! Oops. How did I miss that? Also, I should have known better than to use that particular image. It was the only interesting-looking one I could find using Google, though, so I had to go with it. I like hearing that you're in a similar -- and maybe even better! -- position, by the way. Have you been bringing stuff back to Australia with you for a while now? How long do you think it'll take to get all of it (or at least all that want)? I've been digging up stuff and bringing it (or shipping it) back to Seattle with me for a while now. This is likely the last haul, though. Sure, there are a few things there that I'd still like -- a few extra Dreamcast controllers, for instance -- but that's about it. No worries, Daniel! It happens to the best of us. I really should hunt down that photo again, though, and link folks (if possible) to the person who took it. He or she definitely has a nice collection! When I went to visit my parents 2 years ago they were moving and told me to get rid of my old junk in their basement. Going through it I found my old Commodore Vic-20, Apple IIC and NES. Unfortunately I had no way of bringing them home to Japan with me and my mom was adamant about getting rid of all that junk, so I thought I would lose them forever. Unfortunately the Apple IIC ended up going to the Salvation Army store as I had no way of saving it. The Vic-20 and the NES though I was able to smuggle into the bottom of a box of their stuff that was going to their new home (it was stuff that they would be storing in their new garage so I knew they wouldn`t find it). So someday when we have a place big enough I will have to pay a visit to my parent`s new garage and sneakily retrieve that stuff. I also managed to at least save all my game software for the Apple IIC, so if I ever get another one of those I`ll be able to relive those childhood memories too! Hey there, Sean! Ah, sounds like we're in a somewhat similar situation--or at least we were. My parents aren't moving, but they did want me to either bring some of my old stuff back to Seattle with me or otherwise get rid of it. That's what prompted the dig through my old closet. I look forward to these posts! As for MY closet...nope. I keep every gaming-related ANYTHING in my entertainment center...all the way back to the NES.